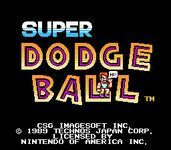 "Super Dodge Ball, released in Japan as Nekketsu Kōkō Dodgeball Bu (熱血高校ドッジボール部 Nekketsu Kōkō Dojjibōru Bu, "Nekketsu High School Dodgeball Club") is a dodgeball-based sports game released for the arcades and the Nintendo Entertainment System developed by Technos. Originally released in Japan as part of the Kunio-kun series, it was re-released for the Wii's Virtual Console in North America on September 22, 2008 at a cost of 500 Wii Points. Source: Wikipedia, "Super_Dodge_Ball," available under the CC-BY-SA License.